In the past itch.io made it possible to sell bundles of your own games at once by letting you set a buy all price on any sale you host. This was a great feature, but a big downside was that there was no way for multiple developers to get together and host a bundle. Starting today it’s now possible for many developers to get together and organize their own bundles! We’re calling them co-op bundles. Bundles have had an interesting effect on perceived value of independent video games. Many bundle sites have popped up over the past few years. They all seem focused on driving down the price as low as possible in order to squeeze as many sales as possible. Although in concept it might sound good, the individual developers often get little return. They most likely have little say in the situation. A developer might jump in because it’s the only chance they have to participate in a bundle, but end up getting a few cents per sale. That’s a tough situation to be in. 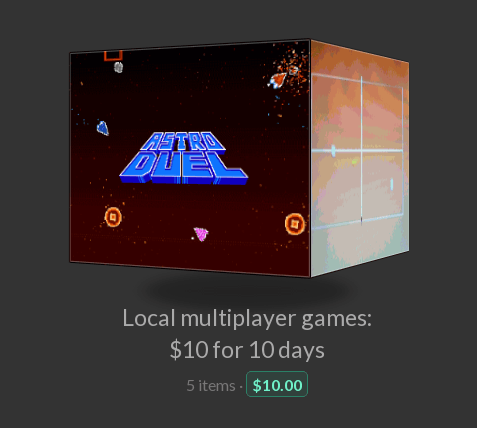 itch.io is now the first site to let the developers organize their own bundles. In the same way that itch.io gives you complete control over how you sell individual games, you now have complete control over how you sell bundles of games. One person acts as the host, they create a new bundle page and paste in the links of the games they want to include. The host picks a revenue split for each developer with content in the bundle. It defaults to equal split. The bundle goes into a pending state after it’s created. The host must ask each participant to visit the bundle page, review it, and click accept. Once everyone has approved the bundle, the host can publish it to the world and people can start buying. That’s it! Bundles utilize itch.io’s payout system to make splitting the earnings a breeze. Just like any other paid content on itch.io, bundles are pay-what-you-want above the minimum. You can even make a 0 dollar bundle! Additionally, just like you can set tiered pricing on your files in an individual game, you can set tiers in a bundle to unlock more games! For more details, check out the Bundles developer guide. We’ve gone ahead and arranged a handful of developers to create some bundles for the launch. Many of the games (and tools) are making their first time appearance on itch.io! 4 hand picked puzzle games. English Country Tune and SpaceChem are available on itch.io for the first time! It’s time to come home. 3 games for $12.99. Test your platforming skills in this frustrating bundle! Five great local multiplayer games for you and your friends! And lastly, we’ve got a treat for all the developers out there. 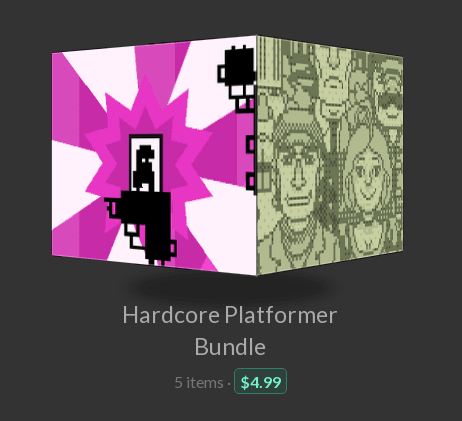 Introducing the first developer-oriented bundle on itch.io, with Aseprite and Superpowers making their itch.io debut. This one is tiered, pay $20 or above for Kenney Game Assets, Kenney Game Stuido, and Aseprite. 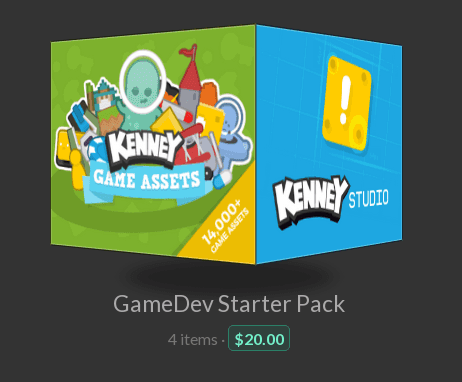 Pay $50 or above to get everything in the previous tier plus the Superpowers game engine and tool set. That’s all for today. Hope you enjoy! P.S. 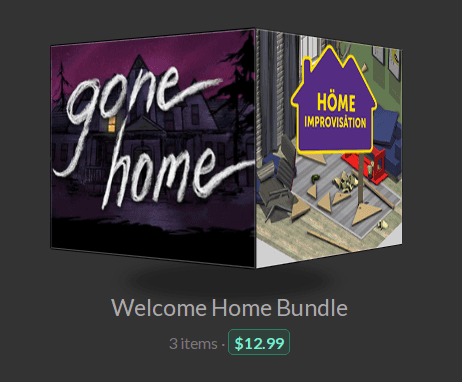 Follow itch.io on Twitter for posts about games and more bundles! 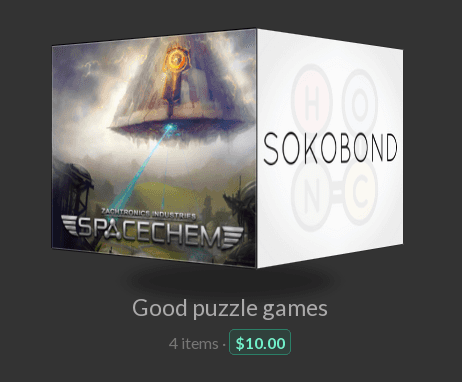 SpaceChem is an obscenely addictive, design-based puzzle game about fake science!